The Honolulu Rail Transit is a 20-mile elevated urban rail transit system under construction on the island of Oahu. 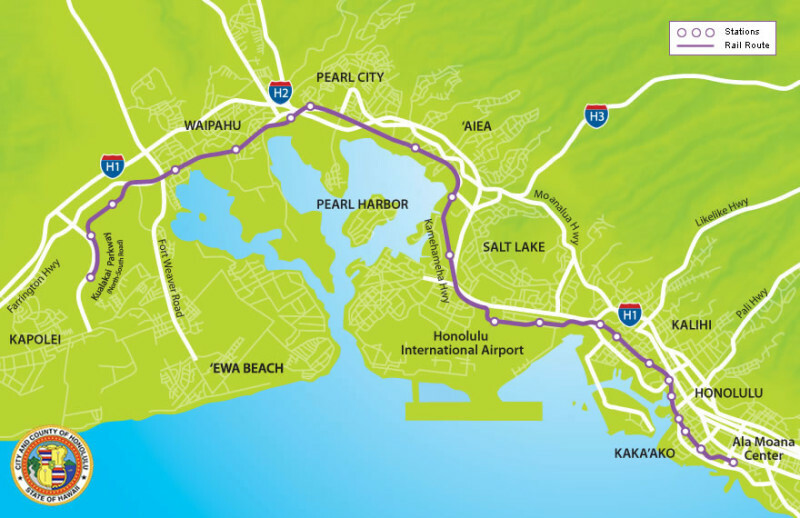 The rail system starts in Kapolei, near the University of Hawaii, West Oahu Campus and extends to Ala Moana Center in Honolulu. The system will consist of 21 transit stations throughout the line. WOC was a sub-consultant providing civil engineering design and traffic engineering services for Phases 3 Airport Section and Phase 4 City Center Section (Design-Bid-Build). Phase 3, Airport Section: This phase installs an approximately 5.2 mile long grade separated fixed guideway rail transit system beginning from the vicinity of Aloha Stadium following along Kamehameha Highway, to Nimitz Highway, transitioning to Aolele Street through Honolulu International Airport, continuing along Ualena Street, Waiwai Loop, skirting along the Freeway, and terminating in the vicinity of Dillingham Boulevard and Laumaka Street. Phase 4, City Center Section: The project installs an approximately 3.9 mile long grade separated fixed guideway rail transit system beginning from the vicinity of Dillingham Boulevard and Luamaka Street, along Dillingham Boulevard, to Kaaahi Street, transitioning across Iwieli Road to Nimitz Highway, continuing to Halekauwila Street, Queen Street, and Kona Street and terminating at Ala Moana Center. WOC was the civil engineer for the widening of the roadways to accommodate the new elevated guideway and support columns. Improvements included modifying, relocating or providing new medians, sidewalks, bus stops, intersections, curb ramps, driveways. WOC also prepared the drainage report and designed the drainage system for the elevated guideway. Work included developing roadway demolition plans, site plans, grading plans, pavement marking and sign plans, typical sections, guideway drainage plans and various associated details. WOC was also the traffic engineer for the Airport Section of the guideway project and responsible for developing maintenance of traffic (MOT) plans, traffic control plans, detour plans, and traffic signal plans. In addition, WOC prepared a Transportation Management Plan for the project which included traffic data collection, traffic analysis and simulation, and identification of traffic management strategies during construction.